Dr. Mary Connor was born and raised in New Orleans, Louisiana. She graduated from the Louisiana State University, School of Veterinary Medicine in 2007. Dr. Connor’s professional interests include: dentistry, internal medicine, soft tissue surgery, preventive care, geriatric patient care, pain management, palliative care and client education among others. Dr. Connor is a Member of The American Veterinary Medical Association, The Florida Veterinary Medical Association, The American Association of Feline Practitioners, The American Heartworm Society, The Miracle Strip Veterinary Medial Society, and The Veterinary Dentistry Academy. To learn more about the organizations above, please visit the Client Education page. Dr. Kristyn Carr grew up in Indiana before moving to Alabama to attend Auburn University. She received a Bachelor’s degree in Zoology in 2013 and earned her DVM degree in 2016. After graduation, Dr. Carr practiced at a small animal veterinary practice in Birmingham, Alabama before eagerly accepting a position at Kindness Pet Hospital in September 2017. 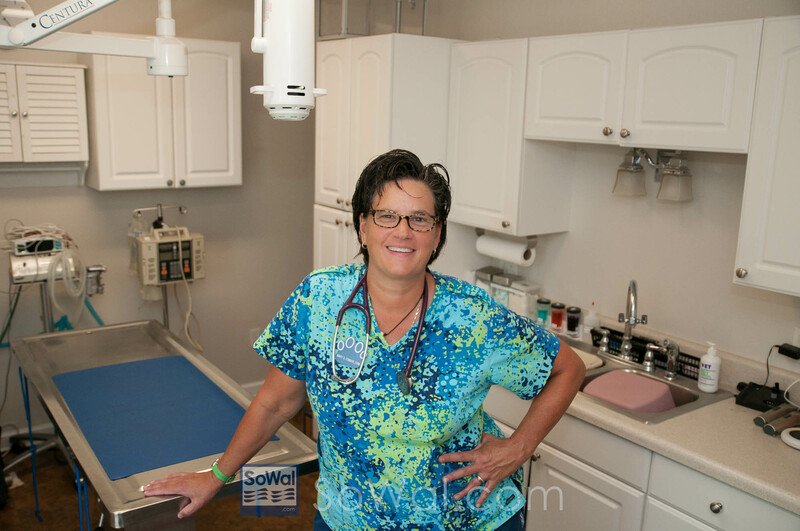 Dr. Carr is so excited to be a part of the team and will strive to continue the excellent standard of care that defines Kindness Pet Hospital. Dr. Carr’s professional interests include ultrasonography, soft tissue surgery, preventive care, dermatology, and exotic companion mammal medicine. Learn more about our practice philosophy on the Welcome and Services pages. You absolutely will not find a more compassionate, dedicated and friendly group of professionals! Our team works tirelessly to make sure that our clients and their pets have everything that they need. April Anson, CVT earned her Bachelor’s degree in Biology from the University of Western Georgia in 2008. She landed her first job in the veterinary profession at 16 years old, working as a kennel technician at a veterinary hospital in her hometown of Newnan, Georgia. “From that first week on, I knew that I wanted a career working with animals.” Before moving to Florida, April worked at a busy companion animal referral practice for 8 years. April has been at Kindness since 2013. She is a member of the Florida Veterinary Technician Association, The Florida Association of Credentialed Veterinary Technicians and The National Association of Veterinary Technicians in America. April’s hobbies include going to the beach and spending time with her family, a yellow Labrador retriever Chevy Louise, a kitten Ore and her husband, Patrick. Marna is a native of Minnesota. She and her husband relocated to sunny 30A in January 2015, after growing tired of Minnesota’s brutal winters. Marna joined the Kindness team in April, 2015. Her hobbies include biking, gardening, traveling and taking beach walks with her rescue dog Pepe le Pew. Fran has worked with animals for over twenty years! Before joining the Kindness team in June of 2016, Fran worked as a veterinary nurse assistant at a local animal rescue/shelter. Fran’s experience with animals also includes a love of large animals. She has worked caring for dressage horses and cattle. A native of Pennsylvania, Fran decided that Florida was the place for her after a visit to the Emerald Coast in 1992. Fran’s hobbies include competing in horsemanship/positive reinforcement training events with her best friends Prince, Buckshot and “V”, and spending time with her husband Jim on their small farm. There, they tend to the chickens, turkeys, cows, horses, as well as their smaller animal companions, two dogs Bindi and Caicos and a rescue cat named Wally. Alexa earned her Bachelor’s degree in Marketing from the University of Alabama in 2014. A native of Montgomery, Alabama she grew up surrounded by animals both small and large! At the age of 6, Alexa got her first horse and showed competitively in the hunter/jumper and quarter horse circuit until the age of 21. Alexa made her way to 30A and found her place at Kindness Pet Hospital in March of 2016, where her love for animals could be expressed in a working environment. Alexa’s goals are to become a registered veterinary technician and be the best mommy she can to her daughter, Lola. On her off days Alexa loves going to the beach with Lola, spending time with her rescue dog Domino and playing cowbell with her significant other, Josh. Carrie earned her LPN degree from Salt Lake City Community College in 2012 and worked as a hospice nurse before moving to Blue Mountain Beach. Carrie has always loved animals and grew up caring for her family’s dogs, cats, rabbits and rats! After working at a local coffee shop for 2 years, Carrie decided to combine her nursing skills with her love for animals and joined the Kindness Pet Hospital team in June of 2016. Carrie and her wife Angela have two cats, Rorie and Simon and a rescue dog, Lilo. Carrie is an avid reader and vinyl record collector. In her free time, she and Angela love to travel, camp, hike, swim and kayak.